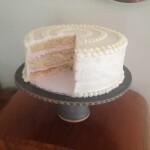 According to Saveur, layer cakes originated in the south and with “their over-the-top grandeur and unapologetic sweetness, they’re inexorably linked to the culture. The drama, excitement, and praise—they all speak to the South.” I was fortunate to grow-up in Mississippi with a mother, who is an extraordinary cook and baker and who experimented with all sorts of foods–from southern to gourmet. 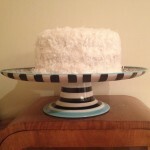 Layer cakes are perfect for marking the special occasions in our lives. 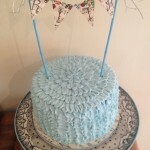 Vanilla Layer Cake with vanilla or chocolate buttercream. 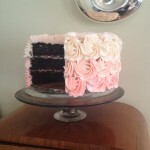 Chocolate Layer Cake with vanilla buttercream or chocolate satin frosting. 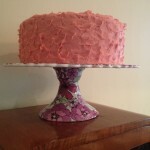 Strawberry Layer cake with fresh strawberries in the cake and frosting. 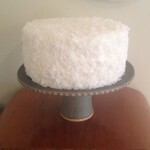 Coconut Layer cake with vanilla cake, vanilla buttercream and covered in coconut. Caramel Layer Cake with vanilla cake and caramel frosting. 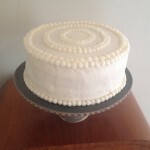 Lemon Layer Cake with lemon cake and lemon buttercream or cream cheese frosting. Carrot Layer Cake with cream cheese frosting. Vegan Layer Cake. I make all sorts of combinations and frequently add layers of raspberry, strawberry, peach or apricot glazes to the fillings. 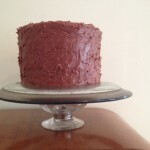 Chocolate Layer Cake (6″) with chocolate satin frosting. 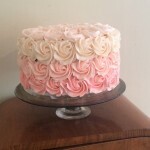 Ombre Rosette Layer Cake (8″). 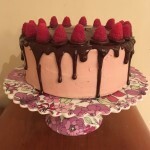 Buttercream icing with double chocolate layer cake and raspberry and buttercream filling. 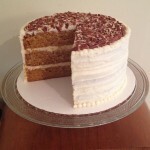 Carrot Layer Cake (8″) with cream cheese frosting and toasted pecans. Quay Webb Camp Carrot Cake. 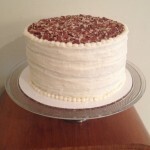 Quay Webb Camp Carrot Layer Cake (8″) with cream cheese frosting and toasted pecans. 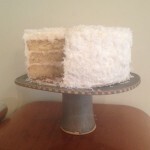 Lemon Layer Cake (8″) with Lemon Buttercream made with fresh lemon juice and lemon zest. 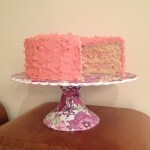 Strawberry Layer Cake (9″) made with fresh strawberries in cake and frosting. Vegan Layer Cake with Pomegranate Glazed Topping. 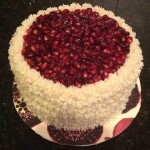 Vanilla cake with pomegranate glaze, pomegranate filling and piped pomegranate star frosting. 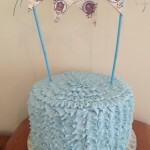 Ribbon buttercream with pennant banner. Almond cake with apricot glaze. 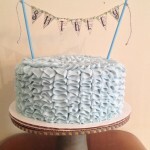 Ribbon buttercream with pennant banner and cake board using vintate sheet music. Hand lettered and painted banner. Hand painted and lettered banner with the reverse side showing interests/photos of recipient on each pennant. 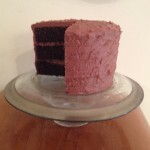 Don’t forget to listen to CAKE by the B-52s when baking (or eating) your layer cake….